I'm excited to launch the first of our signature headshot days happening at the studio and with this time of season its the perfect way to team up and give back. Megan Parker, founder of Fraser Valley Boss Ladies, and marketing & event specialist herself has joined forces with Kristy Powers Portrait to bring you Headshots for a Cause with GivingTuesday. The first time I heard about this day was at the last chamber meeting we attended and we knew we wanted to be a part of this initiative. Most people know about Black Friday and Cyber Monday …now GivingTuesday is coming to Canada on November 29, 2016. Half of the sales from this day will be going directly to causes close to our hearts (more info below) and the remaining proceeds will be reinvested back into the community to support local businesses in Langley! Whats included: $150 - 20 minute session with one look (you can add/remove a tie, scarf, glasses, blazer etc to sneak two 'looks' in one, different background options) your choice of two fully retouched images with print/share release. How to Book or for more info: Email hello@kristypowers.ca or call 604-454-4468. $75 non-refundable deposit required to hold your spot. Payable by cash, cheque, e-transfer or credit card. BONUS: all of my signature headshot days come with an invitation back to credit your $150 to a full portrait session in my studio! This can include full personal branding session for your business, boudoir, glamour/beauty portrait sessions, etc. Megan and I were able to select two causes that are in line with both our companies visions. 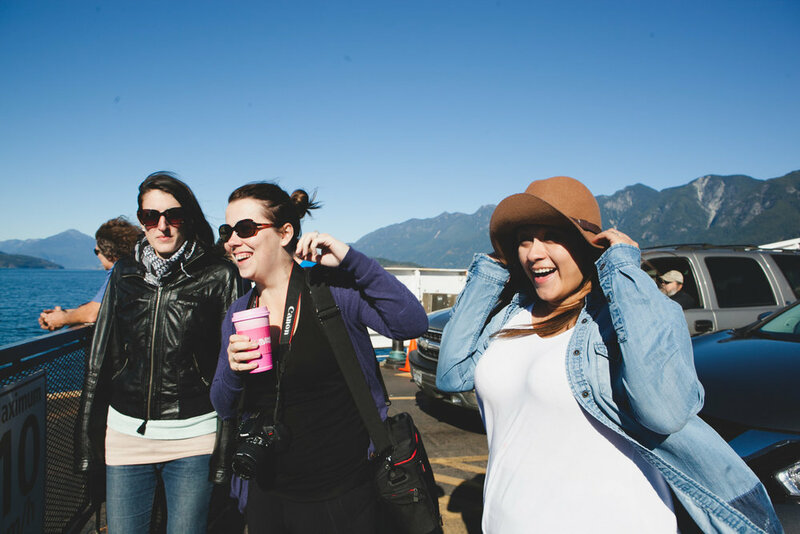 A lot of my photography work focuses on empowering women through portraits and Megan's Fraser Valley Boss Ladies group does the same by supporting female entrepreneurs through networking and collaboration. Our businesses are based in Langley and we are both advocates for supporting the local community. $50 from each session booked will be donated to the Langley Memorial Hospital Foundation. By supporting the LMH Foundation we can make an impact on the healthcare in our community. For me personally, I had my son Evan at this hospital and I love to be able to give back. #blissonbowen. That hashtag nails it. Last month I had the wonderful opportunity to explore Bowen Island for the very first time - and definitely not the last. Having grown up in the Lower Mainland I feel like I ‘know’ most areas of the South Coast. But I never realized what bliss was situated only a 15 minute ferry from Vancouver. And, what really made this trip incredible was the people I went with and the place we stayed. It’s not every day that I hop into a car with strangers. It was literally the first time meeting Janette of Ava to Zoe, and Kat of The Pampered Baby in person when they picked me up. I was already lucky to know Heydy of Raising Jay & Abel, so I figured I would return alive! lol. Realistically, I still would have gone had I not known any of them. I’m a believer in following signs, and I knew this trip was what I needed, and felt that I’d be able to round out our foursome nicely with being able to photograph our journey. I was greeted with the warmest hugs and just like that we were on our way. This journey led us to Nectar Yoga B&B for a Yoga Retreat where we stayed on the property that owner, Andrea, and her partner live. Immediately upon arrival you feel a different way of life, yet you are still so close to the hustle of the city (her partner actually takes the water taxi to his work downtown everyday!) The property has two cottages each with their own desirable features. Janette & Kat stayed up in the Nectar Loft and Heydy and I took the Forest Cottage. Our place had an outdoor shower on the deck! yes, completely outside, but covered in just enough for some privacy but a full view of the majestic forest that surrounds you. What an experience that was! It is a must-do if you stay here. Also on the must-do-list would be to experience the unique Yoga Dome that Andrea teaches out of. Okay,…so I may wear yoga pants on the daily, but I would never consider myself to be Yogi in the slightest, lol. Luckily Andrea has an infectious calming effect and I was excited to try something new. We attended 3 guided Meditation & Yoga sessions during our stay each with different focuses. It ranged from slightly intense with some pilates influence to complete and utter relaxation using bolsters to stretch out areas we don't normally. I truly appreciated all the knowledge, wisdom and snippets of her own personal story she shared with us along the way. It’s been two years since they opened Nectar and started living out their dreams and am so happy for them and all their success. Did I mention she also cooks and serves a delicious & healthy breakfast each morning!? Meals together really gave us the chance to build on our connections with one another, whereas the meditation was great to reflect within. In ways our personal challenges are all different, and in ways they are all the same but Motherhood for all four made for an immediate bond. We stayed up late sharing many stories and laughs (and perhaps some wine) and let go of our day to day worries. It was because of Janette’s wonderful message of Self-Love and her desire to share it with others that we all found ourselves on the trip. I feel so fortunate that I was one of them and to have the help from family to make it possible. Having 3 kids 4 and under and a business to run makes it important to take some time out to keep your cup full. I was anticipating a crazy rest of the month so this was the perfect trip to relax and recharge to head into it.